1. 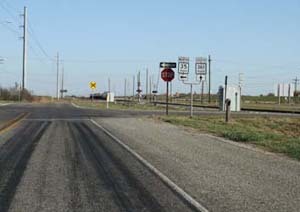 Traveling southbound on US 77 through Refugio, TURN LEFT at FM 774 (traffic light). Go past Courthouse and east 1.5 miles. Stop at red flashing light. 2. TURN RIGHT onto FM 2678 heading south toward Bayside and Corpus Christi. Travel south 15 miles to Bayside. At mid-point this becomes FM 136. 3. 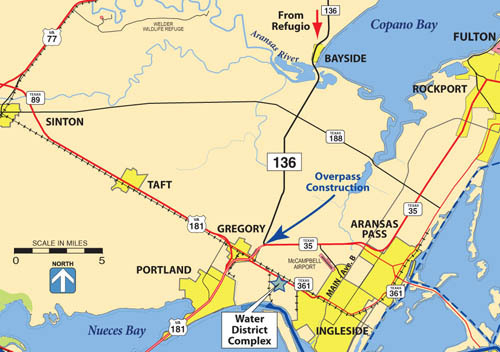 CONTINUE south across the bridge over the mouth of the Aransas River and follow FM 136 until it intersects with SH 35 near Gregory, a total of 12.5 miles. 4. 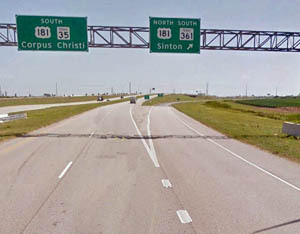 TURN RIGHT onto SH 35 following signs to Gregory/Corpus Christi. .
5. 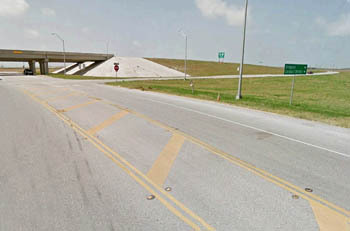 Stay to the right for 0.6 miles and Exit RIGHT from SH 35 following the sign to US 181/SH 361. 6. TURN LEFT at the stop signs and travel under the SH 35 bridges. 7. 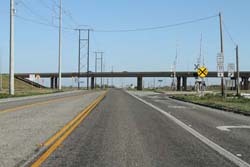 Continue southeast on Spur 202 for 0.9 miles passing through the SH 35 underpass. 8. 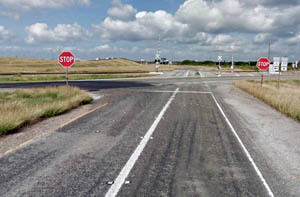 Proceed through the Stop Sign at the SH 35 frontage road. 9. Go straight then angle right to Stop Sign 2 at the intersection with SH 361. 10. 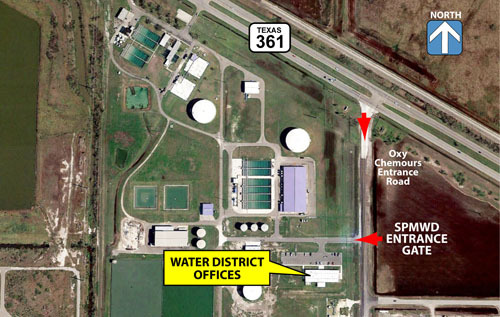 Turn LEFT onto SH 361 and travel southeast for a total of 2.4 miles. You will pass over a rail crossing and go through a signalized intersection with the Sherwin property entrance road. 11. Move to the right turning lane and TURN RIGHT at the traffic light onto the industrial road marked by the landmark signs and flag poles for Oxy and Chemours. 12. Head south 250 yards to the Water District entrance and security gate on your right.